Lieberman proposes a ‘thorough cleansing’ of Gaza! This sort of ‘final solution’ language should have no place in public discourse – let alone in Israel! The only thing harder to stomach than Lieberman’s racist invective is the deafening silence of the international community. How can anyone take any ‘peace process’ seriously when characters like Lierberman are at the helm? Prime Minister Benjamin Netanyahu’s closest political ally has called for Israel to carry out a “thorough cleansing” of the Gaza Strip as a tenuous ceasefire between its Hamas rulers and the Jewish state frayed. Speaking on Israel Radio, the far-right former foreign minister Avigdor Lieberman called for Israel to reconquer the crowded coastal enclave to avoid “finding ourselves in two years with Hamas having aircraft and hundreds of missiles that will reach beyond Tel Aviv”. 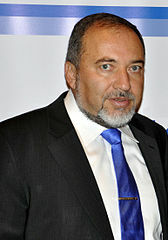 “Without willingness to take things to their conclusion we merely increase the threats,” he said, adding that Hamas “has no intention of coming to terms with the Jewish presence in the land of Israel and therefore what is needed is to seriously consider conquering the Strip and carry out a thorough cleansing.” Mr Lieberman was number two on Mr Netanyahu’s electoral list during elections last January, and currently holds the post of chairman of parliament’s foreign affairs and defence committee. Mr Netanyahu’s office declined to comment on Mr Lieberman’s statements. Yair Lapid, the centrist Finance minister, said the remarks were “irresponsible”. After the rocket fire, Israeli warplanes pounded what the military said were arms storage facilities and a rocket launch site in the Strip. There were no injuries from either the rockets or the air strikes. Israel ordered the closure of the Kerem Shalom and Erez crossings between Gaza and Israel, a step condemned as a “collective punishment” by Jaber Wishah, a spokesman for the Gaza City-based Palestinian Center for Human Rights. Meanwhile, police said vandals slashed the tyres of 21 cars in the Arab Beit Hanina neighborhood of East Jerusalem in the latest of a wave of anti-Arab crimes by suspected Jewish extremists who have struck three times in and around Jerusalem in the past 10 days. Palestinian residents said the government was not doing enough to stop the vandalism. Police spokesman Micky Rosenfeld said police are treating the matter as a “high priority”. Tags: avigdor lieberman, father dave, Gaza Strip, israel, israel and palestine conflict, Lieberman. Filed under israel and palestine conflict by Father Dave on Jun 26th, 2013.